Nani began his career with Ashta Chamma and is slowly consolidating his position as a fine actor with films such as Bheemili Kabaddi Jattu, Ala Modalaindi and Pilla Jamindar. He is getting to work with some of the big names in the Telugu and Tamil industries, such as Rajamouli, Krishnavamsi and Gautham Vasudev Menon. Nani has a small yet significant role in S S Rajamouli's Eega (Naan Ee in Tamil) which releases on July 6. In this exclusive interview with Radhika Rajamani Nani talks about the film, working with Rajamouli and his co-stars, and his forthcoming projects. What was your reaction when you got a call from Rajamouli? Before I got his call, I had heard rumours about me getting the role. I knew about Eega and the lead role through Suresh Babu. When I got the call from Rajamouli and met him, he narrated the story. Nobody has tried anything like this in Telugu cinema. Eega is a landmark film. I'm happy and lucky to get this opportunity. The narration itself was mind blowing and Rajamouli has taken it to another level with the graphics and the execution. Like any normal movie buff, I want to watch the film. You signed the film as it was a Rajamouli film despite knowing that your character didn't have much screen time? It's not about the role or Rajamouli. The story had freshness, the idea was cute. Nobody has dared to do something like this before. I would like to do a small role in a good film. How was it being reborn as a fly? I want to watch the film to see how the fly was made. There was a challenge in the film. I have 20-30 minutes of screen time to connect with the audience. It was challenging and good fun. Yes. The star, the fly, is created. I don't think any film in India has been made on this level. You are acting with Samantha in Eega and in Gautham Vasudev Menon's Yeto Vellipoyindi Manasu. How is she as a co-star? Samantha is a good actress. Besides her glamour and beauty, she is a good performer, which is an added bonus. That's why top directors are pursuing her. Though we worked only for a short span of time in Eega (25 days) I enjoyed working with her. Soon after the shoot was over, both of us signed Gautham Menon's film and we continued to act together. It was good fun. What have you learnt from Rajamouli? I learnt a lot on the personal front. He is full of positive energy which reflects in his work. Even though he is a top director, he is down to earth. He works all the 24 hours. When people are successful they usually become lazy. He is passionate about cinema and talks about it all the time. Also, he believes he has to learn. He wants to learn more about cinema all the time. Rajamouli also made a music video with you. How did that happen? After the Eega shoot, I moved on to Gautham Menon's film. Rajamouli got this idea to do a promo song, My Name Is Nani, as a teaser. He felt there was a gap after the audio release and this teaser could be shown before the release. So I flew down from Chennai, where I was shooting, to Hyderabad and shot for two days. It's not in the film though. Eega is a bilingual (Telugu and Tamil). Are there any changes in the Tamil version? Some actors are different like Santhanam in the Tamil version. Maybe there are a few location changes. Script wise, the story of Eega is universal. It's a simple story which everyone can understand. How was it working with Sudeep who plays the villain? I just have a couple of scenes with Sudeep. He's a mind-blowing actor. Normally the villain is shown with knives/pistols and with background music so that he looks scary. Here Sudeep is a classy guy and makes you feel scared with his performance. I've watched his films in Kannada where he has done films that have fun, romance, comedy etc. He is very convincing as a villain. He is perfect in comedy too. He's a versatile actor who can do anything. 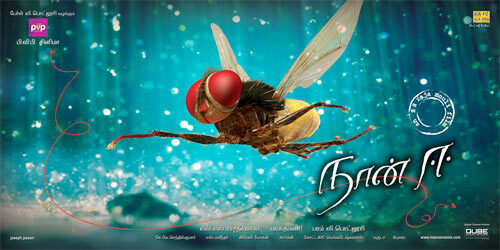 What are your expectations of Eega? I don't have expectations. I am proud to be part of Eega and happy too. I want to watch it with the crowd. What's the impact Eega will create? Eega will break calculations that big star films alone work. It will prove that good cinema works. With good content a solid director can make a film without a superstar. Not much has been done in graphics; it will set young filmmakers thinking on those lines. How far has Yeto Vellipoyindi Manasu progressed? There's one more schedule to go. What's the status of Krishnavamsi's film and what's it about? It's 50 per cent done. The film is an action thriller. The script revolves around money. Have you signed any Telugu films? I have signed a Telugu film to be directed by Samuthirakani. It's a good script and I am excited about the film. The shoot may begin in the end of August. You have worked with Rajamouli. You are doing films with Gautham Vasudev Menon and Krishnavamsi, all top directors, so early in your career. How do you feel? I'm happy to be working with such people as I get to learn something every day. Each has his own working style and I'm learning the USP of each one. Every day is a learning day.